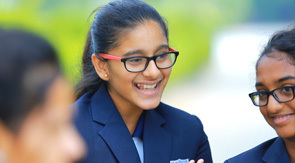 The entire IB and Cambridge faculty at Manchester International School is experienced and highly qualified. They are enthusiastic and keen professionals who believe in teamwork to ensure that uppermost and best quality of education is imparted to students Teachers are expected and required to attend various professional development sessions to maintain high standards. All our teachers are IB trained and many have significant previous experience in other schools around the city and country. We invest heavily in the continuous development of our teachers with workshops and seminars, both, in-school and regional conducted by the IB and CIE. Our belief is to have a diverse faculty that goes a long way in preparing students to adapt to a rapidly globalizing world. Our teachers ensure to familiarize themselves with the students in order to provide constant personal attention to each child and are well-versed in current educational practices and research. They are committed to continued growth as professionals, engaging in ongoing career development and research. The staff has great academic talent and aim to be lifelong learners who are enthusiastic and thoroughly professional. They ensure to maintain overall growth of the student with an innovative and humanistic educational approach. At Manchester International School, the early year’s curriculum is a mix of the Montessori approach and the IB pedagogy. , PYP, IGCSE & AS-A level teachers have been handpicked through a very exhaustive and in-depth process. It is not just the teacher’s credentials that are taken into consideration, but also student handling abilities. We have made sure that they are fluent communicators who constantly strive to find new and innovative methods of presenting the subject to the students in a way that interests them and aids better understanding and retention.Individuals with the ability to keep the students abreast with the changes and developments of the modern world, yet imbibe in them the age-old cultural heritage that this country has always been proudly associated with. They are trained to play multiple roles in the lives of every student; from a disciplinarian to a motivator, a guide and a friend. Constantly and closely working with each student, they are always aware of the needs and limitations of each student and structure their approach accordingly.